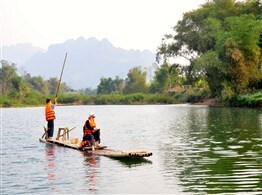 The best tour of Pu Luong that combines all fun things to do in this beautiful natural reserve. 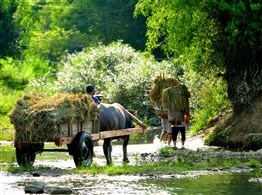 The Pu Luong retreat is a perfect place to stay as it is located in picturesque valley. 4 hour drive from Hanoi with a stopover at beautiful Mai Chau valley, you will arrive in Pu Luong, an untouched natural reserve and home to the Thai and Muong minority. This is our highly recommended tour package that designed to discover the best of Pu Luong, including biodiversity value, mountains, rivers, rice terraced fields, ethnic villages, culture, etc. Pu Luong is the great place for trekking, biking, rafting, homestay and if you want to refesh yourselves, Pu Luong retreat is the best choice. PM: After enjoying delicious food, you have free time to explore the refreshing water to the nearby river, before moving to our pick up point to be transferred back to the Retreat. AM: You have the chance to get close to village life and interact with locals living in the hills above the Retreat. Glimpse at daily life, walk around working farmland and rice fields, and learn about making weaving colourful textiles, followed by lunch at the Lodge.